Climate change is a global issue that does not respect national border. Looking at the science behind climate change, we are not referring to weather; weather and climate change are not the same thing. Weather can change from season to season, even hour to hour and sometimes when you least expect it. In other words, weather reflects short-term conditions in the atmosphere while climate change on the other hand, refers to the average temperature and precipitation rates over a long period of time. 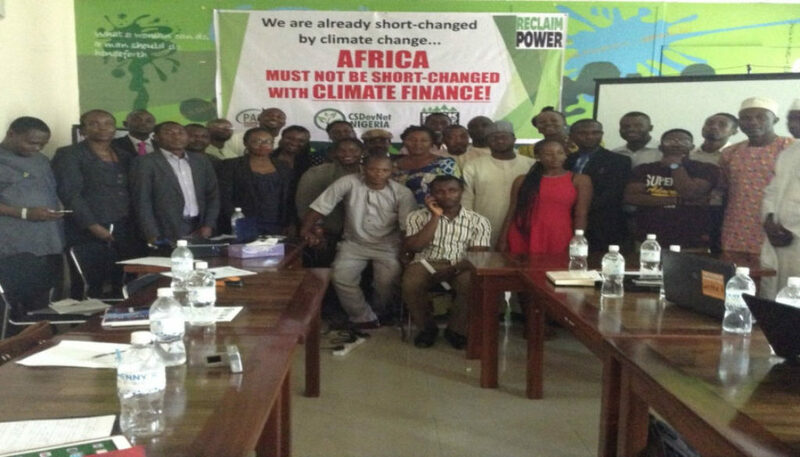 It was a wonderful time as several civil societies met at the Heinrich Boll Hall, Abuja to look at the way forward, since climate change has become an essential part of reality. Global warming is already having severe impact on our socio-economic development, human health, food, wildlife and ecosystems more than we can imagine. Furthermore, The Paris Agreement that was adopted last year during COP21 to UN Framework Convention on Climate Change comprises a landslide agreement in global efforts to mitigate climate change and also prepare countries through adaptive actions to reduce global warming below 20c. The acting Director, Department of Climate Change of Federal Ministry of Environment, Dr. Peter Tarfa, gave a brief overview of what the Nigerian Government is doing to reduce the impact of climate change. He stated that government priority is on the issue of how to adapt to climate change impact, reduce deforestation and also create policy and strategies to help in reducing effect of climate change. National adaptation plan has been mapped out and the issues of capacity building, finance have been captured in the plan. However, Nigeria will observe annual knowledge fare on climate change by bringing expertise together with a theme that affect Nigeria; whereby everyone will bring out what they are doing in respect of climate change thereafter all will be put together to see how it can be used to address the issue. In addition, government will also address the issues of assessing the global climate finance fund from international partners. In this regards, the Ministry of Environment climate finance desk have been given two years mandate to triple assess to global climate funds. However, Nigeria’s national climate policy requires policy intervention, it is due for review because it does not have current capacity to carry out the emerged climate change issues. After the ratification of the Paris Agreement it became a commitment. The five major areas that are Nigeria’s priority are power, oil & gas, transportation, agriculture, and industry. Nigeria’s priority in COP22 are assessing the global climate finance, let the framework be available, to get international funding to loss and damages e.g. flooding and elements for Paris Agreement to be dished out. As we all know, the Minister of Environment mandate is to empower people, tackle climate change and protect the environment.